Fiat Chrysler CEO Sergio Marchionne will retire in 2019. 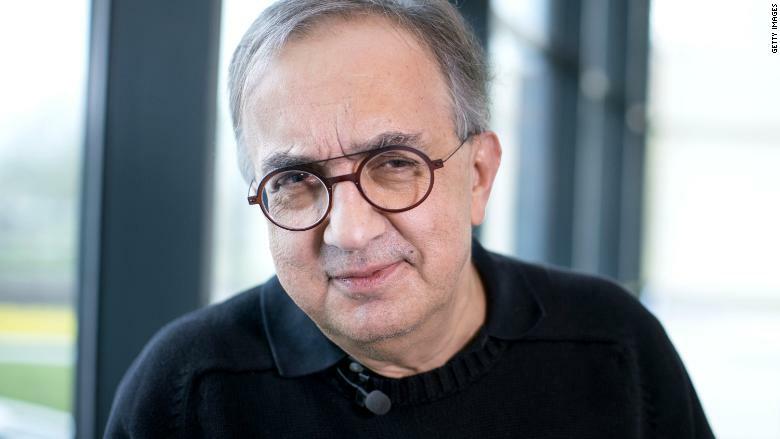 On Friday Fiat Chrysler CEO Sergio Marchionne is set to unveil his vision for the automaker's future after he retires next year. That's fitting, considering that Chrysler probably wouldn't be around today if it weren't for Marchionne. Marchionne was the CEO of Fiat when he brought Chrysler out of bankruptcy in 2009. At the time, there was serious doubt that the automaker could be saved. The Obama administration was in the process of bailing out rival General Motors (GENERAL MOTORS), but it was debating whether it should just let Chrysler die. Obama's team eventually decided to bail Chrysler out to avoid another shock to the economy, particularly to Chrysler's suppliers, more than because of any real faith in the automaker's long term viability. Now, as Marchionne takes the stage at the Fiat proving grounds in Balocco, Italy, to unveil his five-year plan, the company is a debt-free, profitable global automaker. Last year it sold 2 million vehicles in the US -- more than double its sales in the dark days of 2009. Globally, FCA sold 4.7 million cars last year. "I think it's fair to say that without Sergio, there's a good chance Chrysler does not exist today," said Michelle Krebs, senior analyst at AutoTrader. "It might have been sold off in pieces. But he deserves the credit for saving the company." But even with its current success, Chrysler still has some big problems. That's why Marchionne has been looking for a potential buyer for Fiat Chrysler for most of the last ten years. Those efforts haven't gone anywhere, but it's possible his final act could be to finally sell or, once again, merge the company. Fiat Chrysler also trails its competitors in its efforts to introduce electric cars and self-driving vehicles that are the industry's future. It does have a newly-expanded partnership with Waymo, the unit of Google parent Alphabet (GOOG) that is working to develop self-driving car technology. That partnership, which involves Waymo using Chrysler hybrid minivans, is modest compare to those of other companies. For example, GM announced on Thursday that tech investment firm Softbank has agreed to invest $2.25 billion in GM's autonomous vehicle efforts. Finally, as Marchionne prepares to leave the company, some of its brands, particularly Dodge and Chrysler in the U.S., are struggling with aging product line-ups. In 2016 he pulled the plug on those brands small and mid-sized sedans to concentrate on SUVs and pickups. Ford recently followed suit, dropping all but two of its cars from its lineup. "You have a strong Ram franchise, and a strong Jeep franchise," said Stephanie Brinley, principal auto analyst IHS Markit. "But the Chrysler and Dodge brands are not as strong as they were pre-crisis."